This is ane o mony teeps o bluid sausage, likely wi a lairge amoont o addit bacon. Percentages are approximated uisin US recommendations for adults. 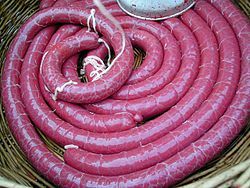 Bluid sausages are sausages filled wi bluid that are cuiked or dried and mixed wi a filler till thay are thick enough tae congeal when cuiled. This page wis last eeditit on 19 Mey 2016, at 20:46.